Washington, DC, United States (KaiserHealth) – Users of Tinder, the popular online dating app, usually swipe right on their mobile screens to gain a potential match. Come September, the same action might allow them to save lives by registering to be an organ donor. The donor registration drive is the culmination of the partnership between Tinder and a nonprofit group called Organize, which aims to end the organ donor shortage. A similar campaign between Tinder and the National Health Service was carried out in Britain last year. Organize is also partnering with the comedy video website Funny or Die, Facebook, various universities and hospitals to launch apps and social media campaigns to boost registrations for organ donations. These partnerships were mentioned as part of a White House push last month to increase organ donations. That effort called for a more streamlined process for organ donations and an increase in research on fields such as tissue preservation and cell-replacement – that may eventually lead to organ replacement. The wait for an organ transplant can be daunting. Half of all kidney transplant patients spend more than 3.6 years waiting for an organ. On average, 22 people die each day while on a transplant list. Traditionally, the registry for organ donation has been run through state motor vehicle departments, and people can register when getting their driver’s license. But that doesn’t capture everyone. According to the White House, 95 percent of Americans support organ donation but only half are registered as donors. 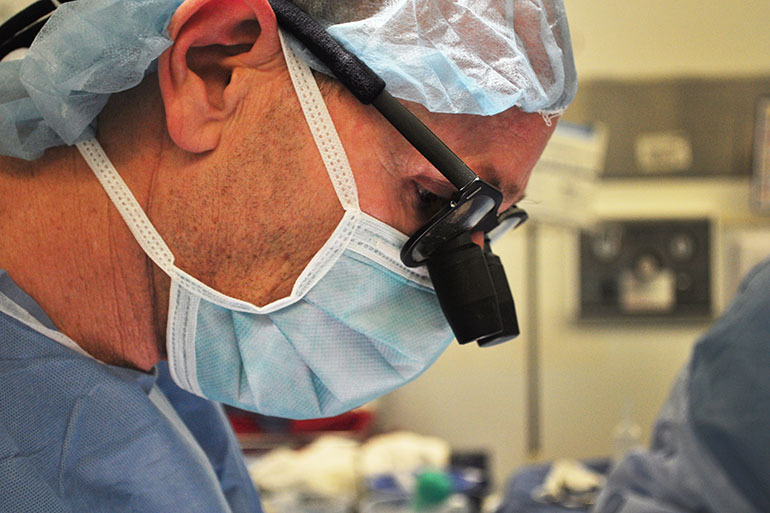 Dr. Thomas Fishbein , a transplant surgeon and the executive director of the MedStar Georgetown Transplant Institute, is optimistic about the Tinder and Organize partnership in attracting potential donors, especially younger ones. His institute is trying a somewhat similar strategy by developing a free app that allows people to indicate their desire to be organ donors. The information would then be sent to the relevant donor registry and to friends or family members designated by the person who is signing up to be a donor. He said the app is slated to go live at the end of this year. Fishbein spoke with Kaiser Health News’ Zhai Yun Tan recently about organ shortages and technology-centered solutions to attract donor. The interview has been edited for length and clarity. Q: Why is there a discrepancy between the number of Americans who support organ donation and those who are actually registered as donors? A: There is not an automated, standardized mechanism through which people — who might generally support organ donation — [can] in a very simple action become registered to be an organ donor. When you turn 16 or 17 and you get your driver’s license, you are asked in many states, because the donor registry collaborates with the motor vehicle administration, if you want to be an organ donor and they print it right on your driver’s license. Right there with a simple “yes” or “no,” a check on the box, you’re registered. [Otherwise] you’ve got to figure out on your own how to become an organ donor. It’s not that easy because you don’t have an automatic interaction. Imagine if every year you fill out your income tax you have to check the box “yes” or “no” — “I will become a donor” or “I won’t become a donor.” You don’t have to opt in, you can opt out, but at least you have an automatic interface and then you turn the form in and you are automatically registered. Q: How did the idea for the app come about? A: We have within MedStar an institute called MI2 which stands for the MedStar Institute for Innovation. This app is Pete Celano’s brainchild. He is a super technologically savvy innovator who comes up with things that bring health care to patients through technology. He happened to have a family friend who needed a transplant and was asked the question “Why the heck don’t we have a super easy simple way that people can just register to be a donor?” That grew out of a simple personal, human interaction. So that’s what transplants are all about — it all comes down to the human interactions that people have. Q: Other initiatives focus very much on sharing personal stories on social media to attract potential donors. What do you think of this approach? A: It’s very individualized what people are comfortable with and not comfortable with. Some feel like their health care needs are very private and don’t feel like sharing them. We’ve had patients who, for instance, did not want us to promote them in local or national news stories and other people are very extroverted and feel very comfortable with that. More and more, people are telling their stories and looking for specific donors who will help them. We have over 1,000 patients right now sitting, waiting on our organ transplant list so we couldn’t possibly get the attention of the news media for a 1,000 patients. The patient and the families may do that themselves. We try to educate the community at large, I think, get [people] invested and active about the problem. Ultimately through actions like these — very easy interactions between a person and turning the idea of supporting organ donation into a concrete action — we’re going to possibly in the future eliminate the shortage that we have now.